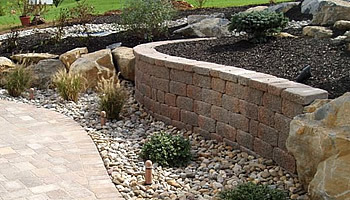 Paverscape Inc. offers a wide variety of retaining walls built by our NCMA certified installers. All of our jobs go above and beyond industry standards so your wall will last the test of time. Our services include residential and commercial retaining walls, multi-tiered walls (large or small), Sitting walls of all styles, bench seat walls, veneer stone walls, boulder walls and natural stone walls. They can be designed as a decorative element of your landscape or for structural integrity on your property. EP Henry Sitting Wall (Dakota Blend 6" & 3" mix) topped with a custom Manchester wall.